Is a Life Jacket in Your Beach Bag? Part Two of my series for “May is National Water Safety Month” covers information on life jackets. Any activity in and around water has potential for risk. As a former swim lesson instructor, I constantly taught children (and adults!) about water safety. I am always incredulous as to why parents send their young child out into a body of water without a life jacket. I smile as I see these two young children enjoying a day at the beach in their life jackets in this photo below. We love water, but we need to be safe. 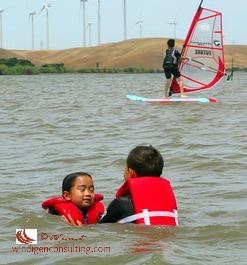 Thankfully, Sacramento County has beaches with the “Kids Don’t Float” life jacket loan program. Adults don’t float either, especially if they have had a few too many adult beverages. Not long ago, I heard the local news person interviewing people on the beaches of the Sacramento River. One gentleman said he always made sure there was a life jacket available…for his dog! He claimed he didn’t need one for himself. Hmmm, I wonder how he would hold up swimming under the influence of those adult beverages? The US Coast Guard is the authority in determining safety of lifejackets. Other terms for these are life vests and PFDs or Personal Flotation Devices. Life jackets come in a variety of forms. The Coast Guard recognizes five types. Look for the wording “Coast Guard-Approved Type I,II, (etc). This is the full life jacket intended for boating, racing, rough waters and stormy conditions. This PFD will turn most unconscious wearers face-up in the water. This style tends to be bulky and uncomfortable, but will keep a victim afloat indefinitely. A popular style, these PFDs can be purchased for as little as $10. These are worn for day cruising, fishing and sailing, and for swimming in open water or swimming pools. This type is less buoyant and requires wearers to tread water to keep their head above water. This type will turn some unconscious wearers face-up in the water. This style of life jacket is the most popular and seen everywhere. These are recommended for boating, water skiing, fishing, paddle sports such canoeing, kayaking and SUP. More comfortable than either Type I or II, it will NOT turn an unconscious victim face-up in the water. These are throw-able devices such as a seat cushion or ring buoy and are not to be worn. These should be immediately available to throw over the side of a boat in case of an emergency. Not intended for unconscious, weak or non-swimmers. The US Coast Guard recognizes several styles in this category, most notably the self-inflatable belt/vest popularly worn by boaters and paddlers to meet federal requirements. This type is also modified for windsurfing and other board sports to wear with wetsuits and harnesses. Also popular for young children are PuddleJumpers which fits into the Type V category. With all life jackets except Type I, an adult should be within arm’s length of weak or non-swimmers who wear these. Life jackets are also available for dogs and come in all shapes and sizes. Dogs can instinctively swim (dog-paddle), therefore a PFD is not required. However, when our dogs accompany us on our SUPs or kayaks at the river, their life jackets have a convenient handle in which to grab them when they decide to jump off! Years ago, I heard a tragic story of a three-year old girl whose parents let her play on the shore of a lake. She happily splashed around in shallow water wearing her bright yellow water wings. Her parents got distracted and took their eyes off their daughter thinking she was protected. A passing boat stirred up a wake which surged onto shore, knocking the child off balance. Just minutes later, the parents found their daughter drowned, face down with her water wings firmly attached to her upper arms. If you are operating a boat, canoe or kayak of any length, you must carry a U.S. Coast Guard-approved life jacket for each person on board. If stored, they should be readily accessible. In California, children under 13 years of age must wear a properly fitted, U.S. Coast Guard-approved life jacket while underway in a boat. The law also says any person on board a personal watercraft (like a Jet Ski) or any person being towed behind a vessel (as in water skiing or wake- or knee-boarding) must wear a U.S. Coast Guard-approved life jacket. For example, if I go out on my stand-up paddle board or kayak without a visible life jacket, and the Department of Fish & Game or Coast Guard vessel approaches me, I can be fined! When visiting beaches, swimming pools, or taking a boat cruise, if you are going to be on or near the water, please protect yourself and your family. Here are several helpful links about life jackets. I had no idea re: WaterWings. Jeez. Horrible. Great post Terri. Very important. And as a gal of the ocean, my jacket of choice is Spinlock. Our rules onboard – lifejackets in rough weather, when out of the cockpit at night, and whenever you want to wear one.. Many boats have a life vest/clip-on rule at night in all conditions. Some boats have a ‘life jacket at all times no matter what’ rule. When I was sailing in the UK (cold waters) I wore a life jacket at all times. When I was sailing in NYC (much smaller boats) I also wore a life jacket at all times. My dog always wore a lifejacket when we sailed together. Hi Lisa, so sorry for the late reply, this fabulous comment went to spam 😦 I will have to check out Spinlock! Great post! There was a lot of very useful information in this! Such an important topic that people should ALWAYS be made aware of. Your pictures in this were insightful. Excellent and much needed post. Well done, Molly! People underestimate the risk of drowning. I am not big on being in the water, and am extra cautious. Will share this to bring awareness to this important topic. Thanks so much for sharing, Molly! Fascinating. Such important information – tragically so many people do underestimate how powerful & dangerous water is, even when you’re a strong swimmer. I find water wings (we call them armbands) useful for my little ones when we take them in the swimming pool, as it is something additional to me that is helping them float, making activities easier. However, I would never have assumed that they were sufficient to save lives, or that they would be good enough to protect a child in any way in open water – I think of them as a swimming aid, not a life saving aid. The thing about the dog with the life jacket, when the man did not have one, reminds me of a documentary I saw a few months ago about the dangers of frozen water. The rescue service people were talking about how many people die jumping into frozen water to ‘save’ dogs who have gone in…and how many dogs die from going into frozen water. Their advice was you don’t worry about dogs in water, even frozen water, as most of them come out alive & perfectly happen on their own, while the same is not true of people. Oh that is so interesting about the ice. It seems to make sense that dogs have instincts to help them in these cases. I think water wings can be helpful, but it is too easy for parents to get lax in their supervision. Thank you for taking the time for this comment! This is VERY good to know, particularly as I have very young children. We have used the water wings that connect to a lifesaver (not sure what they’re called?) as they just seem more secure. Definitely will be looking into a life jacket now. The one photo called the puddle jumper is what you are describing. It’s coast guard-approved. I fully agree on the importance of life jackets and uselessness of water wings. Some very useful info and links here. I knew floaties didnt give protection but false sense of everything is ok. I always look forward to your posts! Pinned and shared to #OverTheMoon! Years ago, when I was an activities director at a campground, parent would get so angry at me for enforcing the “no water wings” rule. I would have liked to have shown them this very informational post. Thanks for sharing at the Blogger’s Pit Stop. You sound like you are water safe all around! Thanks for your comments! Enjoy your water time! My son started taking swim lessons at a young age, just like I did. I’m not fond of swimming, but I’m pretty good at it. My son loves to swim and I’m pleased to say he’s very good! I always thought that water winds were pretty worthless. When my kids were little we had a pool and I always made kids wear life jackets. Now I need to buy some for my husband and I. They have them at the beach where we borrow canoes and kyaks but they are nasty and ill fitting. Do you have a good recommendation for where to find the Type 3 vest types? I have always had an (un)healthy fear of the water. I think it dates back to when I was about 6 and overheard people talking about my neighbor drowning. My kids will attest I am militant about water safety! Definitely go and enjoy it, but take ALL necessary precautions! I am very glad to hear this, Christina, as soon as we let our guard down is inevitably when something tragic happens! thanks for stopping by! Good warning about water wings. We have had and lost each of those types…except maybe the specialty ones. Do you think the life jackets go hide with the socks?